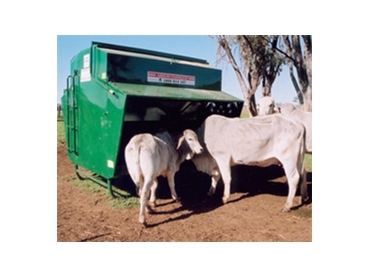 Commander Ag-Quip Innovative Farm Equipment manufacture and supply a wide range of grain feeders that are suitable for feeding cattle, sheep, goats, and horses. Commander grain feeders are made from 1.6mm quality sheet steel and can be supplied painted or in galvanised steel. Cattle grain feeders are available in Jumbo, 5.2 cubic metre capacity, and Standard, 3.4 cubic metre capacity. All feeders feature adjustable flow control doors while the full length lid is operated from the ground. Cattle grain feeders have a ladder and walkway and are also skid mounted to facilitate transport and moving. Skids can also be made lower to cater for sheep feeding. A fully mobile cattle grain feeder option is also available.